Pneumonia is more common in children and the elderly, which is why we should pay special attention to these at-risk groups. Have you ever had pneumonia? If you have, you know how serious it can be. Plus, you’re probably familiar with how important it is to recognize the uncomfortable symptoms of pneumonia. 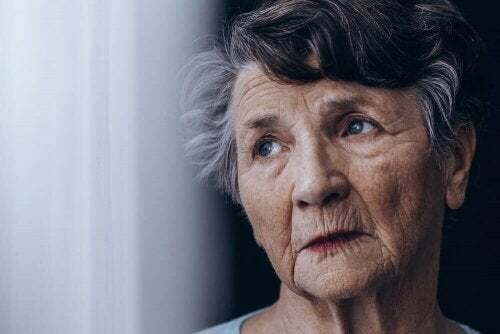 We must be even more careful when it comes to children and the elderly, who may suffer serious consequences if they come down with a case of the ailment. As we’ve said before, your doctor should always be the one to determine which course of treatment you should follow. However we can show you a few simple, natural tips that will definitely help you out. Your health deserves it. Pneumonia is a very common illness. You probably know more than a few people who have had to deal with it at some point in their lives. It’s especially common among the elderly. The symptoms of pneumonia are riskier for this demographic group than for others because of their weak and vulnerable immune systems, so please keep this in mind. Pneumonia is an infection in the lungs that occurs due to a number of microorganisms that attack the alveoli, causing them to swell. These organisms can be viruses, bacteria, or fungi. Your respiratory tract has natural defense mechanisms that keep bacteria from getting into your lungs every day. The first thing you do to “repel” these bacteria is cough. Furthermore, we have a number of cells that make us immune, protecting us against those enemies from outside the body. But what happens when you come down with a case of pneumonia? Well, normally, your immune system is already somewhat weak. The bacteria take advantage of this situation to reach the alveoli and make you sick. Another possible risk factor for pneumonia is smoking. It might also arise more easily you have diabetes or kidney or liver problems. In these cases, your immune system may become even more weak, making your more vulnerable to all kinds of bacteria. What are the most common symptoms of pneumonia? 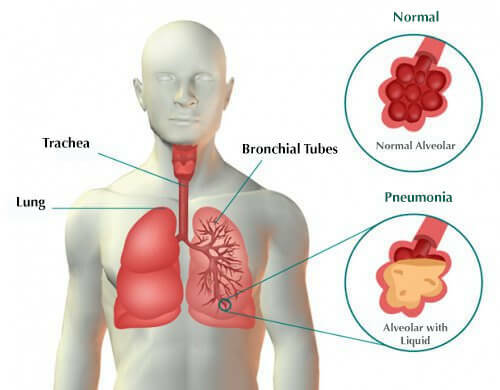 Typical pneumonia: This type of pneumonia may present symptoms right away, or within two to three days. How might you feel? Very tired, with chest pain, as if some kind of external pressure was keeping you from breathing normally. You’ll have an intense cough which might involve expelling phlegm. You will definitely have a slight fever and chills. Atypical pneumonia: This type of pneumonia involves more complex cases, which causes it to be confused with other illnesses quite frequently. It involves headache, joint pain, fever, muscle pain, a dry cough (with no phlegm, unlike the previous case). The patient will also feel tired, but will not feel as much chest pain as with typical pneumonia. As you can see, the symptoms of pneumonia are quite distinctive. These symptoms may indicate something much more serious if they are accompanied by an increased heart rate, a drowning sensation or a loss of consciousness. A high fever can also be dangerous. If you;re not sure how to deal with it or have any questions, make sure to go to your doctor. And, again, remember: pay special attention to children and the elderly. 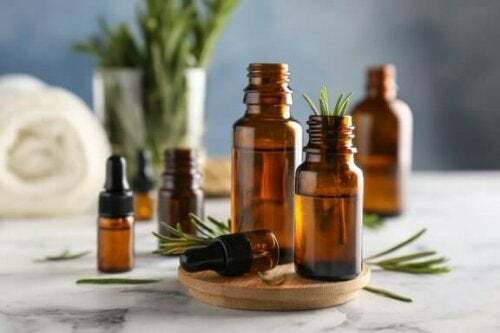 What natural treatment can I follow at home? As we have already mentioned in this article, you should always let your doctor decide which treatment to follow. Sometimes, a simple medication is enough to cure your case of pneumonia. In other, more serious cases, the patient has to be hospitalized. But, don’t worry, it usually turns out fine as long the sick person don’t have a compromised immune system. What good do these do? They are basically aimed at clearing out your lungs and reducing swelling – targeting the symptoms of pneumonia. The hot water vapor from the bath will start loosening up the phlegm on your alveoli and opening up your respiratory tracts, which will greatly alleviate the discomfort you’re feeling. To take an oxygen bath, just fill your bathtub with hot water. Add one cup (200 grams) of rock salt, plus two glasses of hydrogen peroxide (about 400 ml). Get in the bath and relax, breathing normally to inhale the vapor in the air. Stay in the bath for about 20 minutes, and repeat the process once per day. We’re sure you’ve got a bit of ginger root at home and that you’re aware of its medicinal properties. The plant root may help reduce swelling and has positive effects for a number of illnesses. It also acts as a natural antibiotic and relaxer with no side effects. So make sure to drink at least two cups of ginger tea per day. This remedy might not taste great, and it may leave you with bad breath, but we can tell you for sure that combining onions with garlic is an incredibly effective natural treatment. It can help control swelling. It’s a natural antibiotic that anyone can get their hands on. How do you prepare this treatment? It’s really easy. Just chop two cloves of garlic and 50 grams of onion. Chop it all very finely and add one cup of mineral water. You can also add one tablespoon of honey. Mix it all together and drink it in the morning. You’ll be surprised with these effects of this treatment. Before dinner, try this simple carrot juice treatment. Why carrot juice? Because this vegetable is able to strengthen your lungs. It also offers you the anti-oxidants your body needs. Plus, it’s rich in vitamin A, calcium, iron, magnesium, potassium, phosphorus and B vitamins. Make a smoothie with two carrots and one glass of water. It’s super easy!